It has been a tale of two quarterbacks this season. TaQuon Marshall has had to play many roles this season — first string quarterback, team captain, and bearer of the burden of Tech fans’ hope among them. But a leg injury to Marshall during the USF game allowed the Jackets to give redshirt freshman Tobias Oliver some reps at the position, and Oliver excelled; he notably led multiple deep drives to drive Tech out of an early deficit, recording three of Tech’s five touchdowns that day while rushing for 97 yards on just 18 attempts. Oliver looked superb in some extended glances, and with Tech struggling in the standings, to fans’ perception, Oliver getting further looks could represent Tech trying to change up their formula in seeking success. But despite Tech’s early season struggles, Tech is still all the better with Marshall on the field. Statistically, it is difficult to make the argument for Oliver over Marshall. Both players have been stalwarts on the ground. That is something that was expected out of Marshall this season, and something with which Oliver has surprised many. Tech has faced off against some very weak defenses this season, so Marshall and Oliver’s stats are a bit inflated, but Marshall has rushed for slightly more yards per carry — 5.9 — than Oliver’s 5.6. Marshall’s speed and slipperiness have allowed him to show off much better breakaway potential than Oliver; Marshall has multiple 20+ yard rushes this season, but Oliver’s longest rush is just 15 yards. On the ground, Marshall has been better than Oliver in terms of both rate statistics and in terms of explosiveness. But the principal flaw in asking Oliver to see more reps at QB by benching Marshall is that it completely ignores the fourth option in the triple option: passing. The threat of a bomb deep downfield further complicates defending against the triple option, and Marshall, to his credit, has improved his completion rating dramatically this season. It is the least important part of Marshall’s game, but a notable part of his game nevertheless. And crucially, it is a part that Oliver has not displayed at all. Oliver has yet to make a single pass attempt despite having thirty plays from scrimmage under his belt. Oliver was a capable passing quarterback in high school, yet he has not thrown the ball at all this season. That Johnson appears to be uncomfortable with asking Oliver to pass shows that Oliver’s arm is not where Johnson would like it to be. Seeing as Marshall is quite close to hitting his preseason target of a 50 percent completion rate, Marshall is performing exactly as well as Johnson has asked him to do: accumulating yardage on the ground and heaving the ball rarely yet more successfully. Oliver has not quite demonstrated that he can play both roles better than Marshall — or, in the case of one of those roles, at all. In fact, when Tech faced a third and nine during the USF contest, Johnson pulled out Oliver and inserted the still-injured Marshall, who promptly completed a pass for a first down. That decision should tell observers all they need to know about Oliver’s one-dimensionality, at least at this point. If Tech wishes to shake things up, it should not indict the offense, which has averaged 500-plus total yards per game while burning up as much clock as possible. The offense, and by proxy, Marshall, has done its job this season. 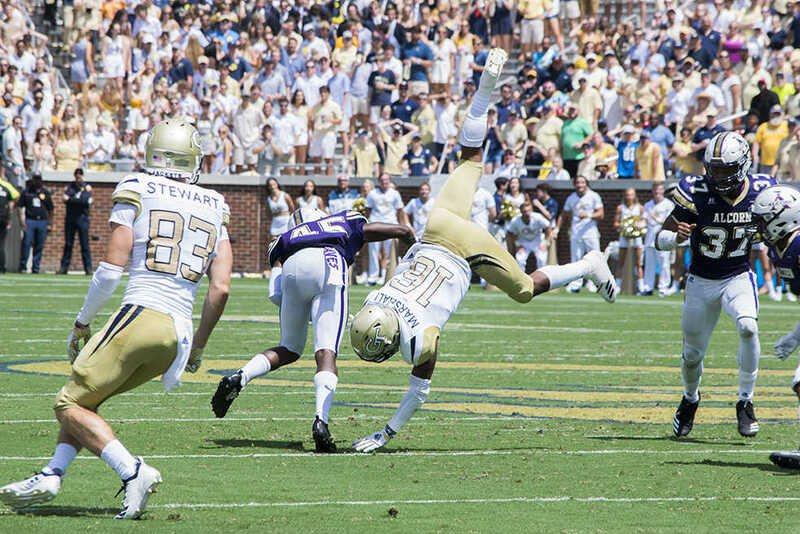 Tech’s struggles have come defensively, failing the Jackets on the road yet again. Aside from the new head coach, there is no highly visible, singular person to blame with regards to Tech’s struggles defensively as there is usually on the offensive side. Regardless, there should be no blame placed on Marshall, who by every measure, has been an effective and improved quarterback. To ask for Tech to shake things up by running Oliver is to fail to understand the depth and cause of Tech’s struggles. Yes, he is far from polished as a passer. Both the sailed pass to an open Jalen Camp and a miscommunication with Camp later during the Pitt game that led to the interception underscore that. And yes, he could stand to make better decisions on the pitch on occasion; that failing has quashed a big play or two. But Marshall is solidly Tech’s best option at quarterback this season, and there is no reason to demand change at the position.